This article refers to the Liturgy of the Hours as a specific manifestation of the public prayer of the Roman rite of the Catholic Church. For its application in other liturgical rites of the Catholic Church and in other communions, see canonical hours. The Liturgy of the Hours (Latin: Liturgia Horarum) or Divine Office (Latin: Officium Divinum) or Work of God (Latin: Opus Dei) or canonical hours,[a] often referred to as the Breviary,[b] is the official set of prayers "marking the hours of each day and sanctifying the day with prayer". It consists primarily of psalms supplemented by hymns, readings and other prayers and antiphons. Together with the Mass, it constitutes the official public prayer life of the Church. The Liturgy of the Hours also forms the basis of prayer within Christian monasticism. Celebration of the Liturgy of the Hours is an obligation undertaken by priests and deacons intending to become priests, while deacons intending to remain deacons are obliged to recite only a part. The constitutions of religious institutes generally oblige their members to celebrate at least parts and in some cases to do so jointly ("in choir"). The laity are under no public obligation to do so, but may oblige themselves to do so by personal vow, and "are encouraged to recite the divine office, either with the priests, or among themselves, or even individually". The Liturgy of the Hours, along with the Eucharist, has formed part of the Church's public worship from the earliest times. Christians of both Western and Eastern traditions (including the Latin Catholic, Eastern Catholic, Eastern Orthodox, Oriental Orthodox, Assyrian, Anglican, Lutheran, and some other Protestant churches) celebrate the Liturgy of the Hours in various forms and under various names. Within the Latin Church, the present official form of the entire Liturgy of the Hours is that contained in the four-volume publication Liturgia Horarum, the first edition of which appeared in 1971. English translations were soon produced and were made official for their territories by the competent episcopal conferences. The three-volume Divine Office, which uses a range of different English Bibles for the readings from Scripture, was published in 1974; the four-volume Liturgy of the Hours, with Scripture readings from the New American Bible, appeared in 1975. Before 1971, the official form for the Latin Church was the Breviarium Romanum, first published in 1568. In the Byzantine Rite, the corresponding services are found in the Ὡρολόγιον (Horologion), meaning Book of Hours. Anglican Liturgy of the Hours is contained in the book of Daily Prayer of Common Worship and the Book of Common Prayer, as well as in the Anglican Breviary. The Lutheran counterpart is contained in the liturgical books used by the various Lutheran church bodies. Other names in Latin liturgical rites for the Liturgy of the Hours include "Diurnal and Nocturnal Office", "Ecclesiastical Office", Cursus ecclesiasticus, or simply cursus. Early Christians continued the Jewish practice of reciting prayers at certain hours of the day or night. In the Psalms are found expressions like "in the morning I offer you my prayer"; "At midnight I will rise and thank you"; "Evening, morning and at noon I will cry and lament"; "Seven times a day I praise you". The Apostles observed the Jewish custom of praying at the third, sixth, and ninth hours, and at midnight (Acts 10:3, 9; 16:25; etc.). The Christian prayer of that time consisted of almost the same elements as the Jewish: recital or chanting of psalms, reading of the Old Testament, to which were soon added readings of the Gospels, Acts, and epistles, and canticles. Other elements were added later in the course of the centuries. This arrangement of the Liturgy of the Hours is described by Saint Benedict. However, it is found in Saint John Cassian's Institutes and Conferences,[not in citation given] which describe the monastic practices of the Desert Fathers of Egypt. After the Second Vatican Council, which decided that the hour of prime should be suppressed, Pope Paul VI decreed a new arrangement of the "Liturgy of the Hours. The structure of the offices, the distribution of psalms, and the prayers were updated. The distinction, already expressed in the 1960 Code of Rubrics, between the three major hours (Matins, Lauds and Vespers) and the minor hours (Terce, Sext, None and Compline) has been retained. All hours, including the minor hours, start with the versicle from Ps 70 (69) v. 2 (as do all offices in the traditional breviary except Matins and Compline): "V. Deus, in adiutorium meum intende. R. Domine, ad adiuvandum me festina" (God, come to my assistance; Lord, make haste to help me), followed by the doxology. The verse is omitted if the hour begins with the Invitatory (Lauds or Office of Reading). The Invitatory is the introduction to the first hour said on the current day, whether it be the Office of Readings or Morning Prayer. The opening is followed by a hymn. The hymn is followed by psalmody. The psalmody is followed by a scripture reading. The reading is called a chapter (capitulum) if it is short, or a lesson (lectio) if it is long. The reading is followed by a versicle. The hour is closed by an oration followed by a concluding versicle. Other components are included depending on the exact type of hour being celebrated. In each office, the psalms and canticle are framed by antiphons, and each concludes with the traditional Catholic doxology. The major hours are the Office of Readings, Morning (or Lauds) and Evening Prayer (or Vespers). two psalms, or parts of psalms with a scriptural canticle. At Morning Prayer, this consists of a psalm of praise, a canticle from the Old Testament, followed by another psalm. At Evening Prayer this consists of two psalms, or one psalm divided into two parts, and a scriptural canticle taken from the New Testament. a blessing given by the priest or deacon leading Morning or Evening Prayer, or in the absence of clergy and in individual recitation, a short concluding versicle. Marian antiphon without versicle and concluding prayer; either one of the four traditional seasonal antiphons, or Sub Tuum, or another antiphon approved by the local episcopal conference; the Regina Caeli is always used in Eastertide. An Invitatory precedes the canonical hours of the day beginning with the versicle "Lord, open my lips. And my mouth will proclaim your praise" (Ps 50/51 v.17), and continuing with an antiphon and the Invitatory Psalm, usually Psalm 94/95. All psalms and canticles are accompanied by antiphons. Unless the Invitatory is used, each Hour begins with the versicle "God, come to my assistance. Lord, make haste to help me" (Ps 69/70 v.2), followed by a hymn. Each Hour concludes with a prayer followed by a short versicle and response. Matins or the Office of Readings is the longest hour. Before Pope St. Pius X's reform, it involved the recitation of 18 psalms on Sundays and 12 on ferial days. Pope Pius X reduced this to 9 psalms or portions of psalms, still arranged in three "nocturns", each set of three psalms followed by three short readings, usually three consecutive sections from the same text. Pope Paul VI's reform reduced the number of psalms or portions of psalms to three, and the readings to two, but lengthened these. On feast days the Te Deum is sung or recited before the concluding prayer. After St. Pius X's reform, Lauds was reduced to four psalms or portions of psalms and an Old Testament canticle, putting an end to the custom of adding the last three psalms of the Psalter (148–150) at the end of Lauds every day. The number of psalms or portions of psalms is now reduced to two, together with one Old Testament canticle chosen from a wider range than before. After these there is a short reading and response and the singing or recitation of the Benedictus. Vespers has a very similar structure, differing in that Pius X assigned to it five psalms (now reduced to 2 psalms and a New Testament canticle) and the Magnificat took the place of the Benedictus. On some days in Pius X's arrangement, but now always, there follow Preces or intercessions. In the present arrangement, the Lord's Prayer is also recited before the concluding prayer. Terce, Sext and None have an identical structure, each with three psalms or portions of psalms. These are followed by a short reading from Scripture, once referred to as a "little chapter" (capitulum), and by a versicle and response. The Lesser Litany (Kyrie and the Lord's Prayer) of Pius X's arrangement have now been omitted. Prime and Compline also were of similar structure, though different from Terce, Sext and None. In monasteries and cathedrals, celebration of the Liturgy of the Hours became more elaborate. Served by monks or canons, regular celebration required a Psalter for the psalms, a lectionary for the Scripture readings, other books for patristic and hagiographical readings, a collectary for the orations, and also books such as the antiphonary and the responsoriary for the various chants. These were usually of large size, to enable several monks to chant together from the same book. Smaller books called breviaries (a word that etymologically refers to a compendium or abridgment) were developed to indicate the format of the daily office and assist in identifying the texts to be chosen. These developed into books that gave in abbreviated form (because they omitted the chants) and in small lettering the whole of the texts, and so could be carried when travelling. Pope Innocent III made them official in the Roman Curia, and the itinerant Franciscan friars adopted the Breviarium Curiae and soon spread its use throughout Europe. By the 14th century, these breviaries contained the entire text of the canonical hours. The invention of printing made it possible to produce them in great numbers. In its final session, the Council of Trent entrusted to the Pope the revision of the breviary. With his Apostolic Constitution Quod a nobis of 9 July 1568, Pope Pius V promulgated an edition of the breviary, known as the Roman Breviary, which he imposed in the same way in which, two years later, he imposed his Roman Missal. Using language very similar to that in the bull Quo primum, with which he promulgated the Missal – regarding, for instance, the perpetual force of its provisions – he made it obligatory to use the promulgated text everywhere. He totally prohibited adding or omitting anything: "No one whosoever is permitted to alter this letter or heedlessly to venture to go contrary to this notice of Our permission, statute, ordinance, command, precept, grant, indult declaration, will decree and prohibition. Should anyone, however, presume to commit such an act, he should know that he will incur the wrath of Almighty God and of the Blessed Apostles Peter and Paul." It is obvious that he did not thereby intend to bind his successors. Pope Clement VIII made changes that he made obligatory on 10 May 1602, 34 years after Pius V's revision. Urban VIII made further changes, including "a profound alteration in the character of some of the hymns. Although some of them without doubt gained in literary style, nevertheless, to the regret of many, they also lost something of their old charm of simplicity and fervour." For the profound revision of the book by Pope Pius X see Reform of the Roman Breviary by Pope Pius X. Finally, a new revision was made by Pope Paul VI with his Apostolic Constitution Laudis Canticum of 1 November 1970. Many of the complicated rubrics (or instructions) that had governed recitation of the Liturgy were clarified, and the actual method of praying the office was made simpler. Prime had already been abolished by the Second Vatican Council. Of the three intermediate Hours of Terce, Sext and None, only one was to be of strict obligation. Recitation of the psalms and a much increased number of canticles was spread over four weeks instead of one. "Three psalms (58, 83, and 109) have been omitted from the psalter cycle because of their curses; in the same way, some verses have been omitted from certain psalms, as noted at the head of each. The reason for the omission is a certain psychological difficulty, even though the psalms of imprecation are in fact used as prayer in the New Testament, for example, Rv 6:10, and in no sense to encourage the use of curses." Two typical editions for celebrating the revised Liturgy of the Hours (Liturgia Horarum) according to the Roman Rite have been published by Rome. The current typical edition for the Ordinary Form of the Roman Rite is the Liturgia Horarum, editio typica altera, promulgated in 1985 (printed between 1985 and 1987, and reprinted in 2000). This uses the Nova Vulgata Latin Bible for the readings, psalms and canticles rather than the Clementina. It has changed some of the readings and responsories according to the Nova Vulgata, and it provided for the Benedictus and Magnificat on Sundays with three antiphons each that reflect the three-year cycle of Gospel readings. Pope Urban VIII's lamented alterations of the hymns are undone. Verse numberings are added to the Psalms and the longer Scripture readings, while the Psalms are given both the Septuagint numbering and (in parentheses) that of the Masoretic text. And new texts, taken from the Missale Romanum, have been added in the appendix for solemn blessings and the penitential acts. Thus far, this second Latin typical edition has only been translated in the Liturgy of the Hours for Africa. The earlier edition has appeared in two English translations, one under the title "Liturgy of the Hours", the other as "The Divine Office". In the Latin Church of the Catholic Church, bishops, priests, and deacons planning to become priests are obliged to recite the full sequence of the hours each day, keeping as far as possible to the true time of day, and using the text of the approved liturgical books that apply to them. Permanent deacons are to do so to the extent determined by their Episcopal Conference. Members of institutes of consecrated life, societies of apostolic life, or other religious associations (e.g., Benedictine oblates, Third Order Dominicans) who are not clerics and are therefore not subject to these obligations are bound according to the norm of their constitutions. Members of such institutes and societies who are deacons, priests, or bishops, remain bound to their more severe obligation as clergy. Latin Church clerics can lawfully fulfill their obligation to pray the Office using the edition of the Roman Breviary promulgated by John XXIII in 1961 rather than the current edition of the Liturgy of the Hours. While the 2007 motu proprio Summorum Pontificum states that communities belonging to institutes of religious life and societies of apostolic life require authorization only by their major superiors to use the 1962 edition of the Roman Missal for their conventual or community Mass frequently, habitually or permanently; it makes no such statement regarding use of the 1962 Liturgy of the Hours, which however could be allowed by their constitutions. Laity, especially if they are involved in ministries of the Church (lector, cantor, extraordinary minister of Holy Communion, catechists, religious education directors or school principals, altar servers, those contemplating religious life or the seminary), are strongly encouraged to participate. 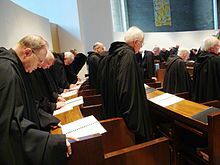 The constitutions of some institutes of consecrated life, in particular many congregations of Benedictine monks and nuns, but also others, oblige them to follow an arrangement of the Psalter whereby all the psalms are recited in the course of a single week, partly through an extension of the Office of Readings, and by maintaining the Hour of Prime. As is noted above, the canonical hours stemmed from Jewish prayer. During the Babylonian Exile, when the Temple was no longer in use, the first synagogues were established, and the services (at fixed hours of the day) of Torah readings, psalms, and hymns began to evolve. This "sacrifice of praise" began to be substituted for the sacrifices of animals. By the time of the Roman Empire, the Jews (and eventually early Christians) began to follow the Roman system of conducting the business day in scheduling their times for prayer. In Roman cities, the bell in the forum rang the beginning of the business day at about six o'clock in the morning (Prime, the "first hour"), noted the day's progress by striking again at about nine o'clock in the morning (Terce, the "third hour"), tolled for the lunch break at noon (Sext, the "sixth hour"), called the people back to work again at about three o'clock in the afternoon (None, the "ninth hour"), and rang the close of the business day at about six o'clock in the evening (the time for evening prayer). The first miracle attributed to the Apostles, the healing of the crippled man on the temple steps, occurred because Peter and John went to the Temple to pray (Acts 3:1). This was at the "ninth hour" of prayer (about three pm), the time at which the "evening" sacrifice was celebrated in the Temple in the New Testament (Second Temple) period. One of the defining moments of the early Church, the decision to include Gentiles among the community of believers, arose from a vision Peter had while praying at noontime (Acts 10:9–49). This was at the "sixth hour," the time of the Mussaf prayers associated with additional sacrifices in the Temple on special days. As Christianity began to separate from Judaism, the practice of praying at fixed times continued. The early church was known to pray the Psalms (Acts 4:23–30), which has remained a part of the canonical hours and all Christian prayer since. By 60 AD, the Didache, the oldest known liturgical manual for Christians, recommended disciples to pray the Lord's Prayer three times a day; this practice found its way into the canonical hours as well. Pliny the Younger (63 – c. 113), who was not a Christian himself, mentions not only fixed times of prayer by believers, but also specific services—other than the Eucharist—assigned to those times: "they met on a stated day before it was light, and addressed a form of prayer to Christ, as to a divinity ... after which it was their custom to separate, and then reassemble, to eat in common a harmless meal." By the second and third centuries, such Church Fathers as Clement of Alexandria, Origen, and Tertullian wrote of the practice of Morning and Evening Prayer, and of the prayers at terce, sext, and none. The prayers could be prayed individually or in groups. By the third century, the Desert Fathers (the earliest monks), began to live out St. Paul's command to "pray without ceasing" (1 Thessalonians 5:17) by having one group of monks pray one fixed-hour prayer while having another group pray the next prayer. As the format of unbroken fixed-hour prayer developed in the Christian monastic communities in the East and West, longer prayers soon grew, but the cycle of prayer became the norm in daily life in monasteries. By the fourth century, the characteristics of the canonical hours more or less took their present shape. For secular (non-monastic) clergymen and lay people, the fixed-hour prayers were by necessity much shorter. In many churches and basilicas staffed by monks, the form of the fixed-hour prayers was a hybrid of secular and monastic practice. In the East, the development of the Divine Services shifted from the area around Jerusalem to Constantinople. In particular, St. Theodore the Studite (c. 758 – c. 826) combined a number of influences from the Byzantine court ritual with monastic practices common in Asia Minor, and added thereto a number of hymns composed by himself and his brother Joseph (see Typicon for further details). In the West, St. Benedict in his famous Rule modeled his guidelines for the prayers on the customs of the basilicas of Rome. It was he who expounded the concept in Christian prayer of the inseparability of the spiritual life from the physical life. The Benedictines began to call the prayers the Opus Dei or "Work of God." As the Divine Office grew more important in the life of the Church, the rituals became more elaborate. Soon, praying the Office began to require various books, such as a psalter for the psalms, a lectionary to find the assigned Scripture reading for the day, a Bible to proclaim the reading, a hymnal for singing, etc. As parishes grew in the Middle Ages away from cathedrals and basilicas, a more concise way of arranging the hours was needed. So, a sort of list developed called the Breviary, which gave the format of the daily office and the texts to be used. The spread of breviaries eventually reached Rome, where Pope Innocent III extended its use to the Roman Curia. The Franciscans sought a one-volume breviary for its friars to use during travels, so the order adopted the Breviarium Curiae, but substituting the Gallican Psalter for the Roman. The Franciscans gradually spread this breviary throughout Europe. Pope Nicholas III would then adopt the widely used Franciscan breviary to be the breviary used in Rome. By the 14th century, the breviary contained the entire text of the canonical hours. The Council of Trent, in its final session on 4 December 1563 entrusted the reform of the breviary to the then pope, Pius IV. On 9 July 1568, Pope (Saint) Pius V, the successor to Pius IV who closed the Council of Trent, promulgated an edition, known as the Roman Breviary, with his Apostolic Constitution Quod a nobis, imposing it in the same way in which, two years later, he imposed his Roman Missal and using language very similar to that in the bull Quo primum with which he promulgated the Missal, regarding. For instance, the perpetual force of its provisions, the obligation to use the promulgated text in all places, and the total prohibition of adding or omitting anything, declaring in fact: "No one whosoever is permitted to alter this letter or heedlessly to venture to go contrary to this notice of Our permission, statute, ordinance, command, precept, grant, indult declaration, will decree and prohibition. Should anyone, however, presume to commit such an act, he should know that he will incur the wrath of Almighty God and of the Blessed Apostles Peter and Paul." St. Mark’s Basilica in Venice, along with the four churches under its jurisdiction, retained its own unique liturgies, psalm cursi, and Latin translations into the 19th century. Many other churches whose local rites predated Pius V's breviary by 200 years or more, such as that of Mantua, continued to use their own breviaries, liturgical calendars, and psalm cursi, as well. Later popes altered the Roman Breviary of Pope Pius V. Pope Clement VIII instituted obligatory changes on 10 May 1602, 34 years after Pius V's revision. Pope Urban VIII made further changes, including "a profound alteration in the character of some of the hymns. Although some of them without doubt gained in literary style, nevertheless, to the regret of many, they also lost something of their old charm of simplicity and fervour." Pope Pius X made a radical revision of the Roman Breviary, to be put into effect, at latest, on 1 January 1913. See Reform of the Roman Breviary by Pope Pius X.
Pope Pius XII allowed the use of a new translation of the Psalms from the Hebrew and established a special commission to study a general revision, concerning which all the Catholic bishops were consulted in 1955. His successor, Pope John XXIII, implemented these revisions in 1960. Following the Second Vatican Council, the Catholic Church's Latin Church, hoping to restore their character as the prayer of the entire Church, revised the liturgical book for the celebration of the Divine Office, and published it under the title "Liturgy of the Hours". The Council itself abolished the office of Prime, and envisioned a manner of distributing the psalms over a period of more than 1 week. In the succeeding revision, the character of Matins was changed to an Office of Readings so that it could be used at any time of the day as an office of Scriptural and patristic readings. Furthermore, the period over which the Psalter is recited has been expanded from one week to four. The Latin hymns of the Roman Office were in many cases restored to the pre-Urban form, albeit several of them were shortened. This new "Liturgy of the Hours" (Liturgia Horarum in Latin) is published by Libreria Editrice Vaticana in four volumes, arranged according to the liturgical seasons of the Church year. The current liturgical books for the celebration of the Liturgy of the Hours in Latin are those of the editio typica altera (second typical edition) promulgated in 1985 and re-issued, by the Vatican Publishing House – Libreria Editrice Vaticana, in 2000 and 2003. Although most priests and other clerics in the Latin Church now use the new Liturgy of the Hours, some (such as those in the Priestly Fraternity of Saint Peter or similar societies) continue to use the Breviary as revised by Pope Pius X, the latest edition of which was issued under Pope John XXIII. The motu proprio Summorum Pontificum in 2007 authorized every Latin Church cleric to use this edition to fulfill his canonical obligation to pray the Divine Office. An English/Latin parallel edition was published by Baronius Press in April 2012. Three English translations are in use. Volume III: Weeks of the Church Year 6–34. The psalms are taken (with slight adaptations) from the 1963 Grail Psalms, while the Scripture readings and non-Gospel canticles are taken from various versions of the Bible, including the Revised Standard Version, the Jerusalem Bible, the Good News Bible, the New English Bible and Ronald Knox's Translation of the Vulgate. Some of the canticles taken from the Revised Standard Version were amended slightly to conform the English text to the Vulgate in The Divine Office. The intercessions, concluding prayers, antiphons, short responses, responsories, second readings in the Office of Readings, Te Deum and Glory be to the Father are all translations approved by the Episcopal Conferences mentioned and confirmed by the Holy See in December 1973. The Gospel canticles (Benedictus, Magnificat, Nunc Dimittis) are from the 1963 Grail Translation, but an appendix at the end of the book gives the English Language Liturgical Consultation (ELLC)) versions of the Gospel canticles as alternatives. Shorter Morning & Evening Prayer – comprising the Psalter for Morning, Evening and Night prayers and a selection of texts from the liturgical seasons and feasts. Between 2005 and 2006, Collins republished The Divine Office and its various shorter editions with a new cover and revised Calendar of the Moveable Feasts. Besides these shorter editions of The Divine Office, there used to be A Shorter Prayer During the Day comprising the Psalter for the Middle Hours also published by Collins. The last known reprint year is 1986, but this edition is now out of print. In 2009, Prayer during the day was published by Catholic Truth Society. The Liturgy of the Hours, produced by the International Committee on English in the Liturgy, Inc. (ICEL), was first published in 1975 by Catholic Book Publishing Company in the USA. This edition is the official English edition for use in the USA, Canada and some other English-speaking dioceses. It is in four volumes, an arrangement identical to the original Latin typical edition. The psalms are taken (slightly adapted) from the 1963 Grail Psalms, while the Scripture readings and non-Gospel canticles are taken from the original 1970 first edition New American Bible. The prayers and intercessions are translated by the International Commission on English in the Liturgy (ICEL). The ELLC versions are used for items such as the Gospel canticles. An additional feature are psalm-prayers at the end of many Psalms, which were ICEL's translation of the Liber Orationum Psalmographus, the Book of Psalm-Prayers which originated in the Mozarabic Rite. Shorter editions of the Liturgy of the Hours are also available from various publishers: Christian Prayer (Daughters of St Paul and Catholic Book Publishing Company), Shorter Christian Prayer (Catholic Book Publishing Company) and Daytime Prayer (Catholic Book Publishing Company). In 2007, Liturgy Training Publications released the Mundelein Psalter, containing Morning, Evening and Night Prayers and the Office for the Dead, with the 1963 Grail translation of the Psalms set to specially composed chant, and with hymns translated from the hymns of the Latin Liturgia Horarum. The Divine Office and the Liturgy of the Hours editions are both based on the Latin 1971 editio typica. In 2009, on the occasion of the Synod of African Bishops in Rome, the Catholic Church in Africa, through Paulines Publications Africa, published a new English edition of the Liturgy of the Hours based on the Liturgia Horarum, editio typica altera. The antiphons and orations in this edition are taken from ICEL's 1975 translation of the Liturgy of the Hours, with independent translations for the offices for the new saints added to the General Roman Calendar as well as the Benedictus and Magnificat antiphons for the 3-year cycle on Sundays added in the Liturgia Horarum, editio typica altera. The Psalms are taken from the Revised Grail Psalter with the rest of the biblical texts taken from the New American Bible. To-date, this is the only official English edition of the Office that is based on the Liturgia Horarum, editio typica altera. ^ The term "canonical hours" can mean either the times of day at which the different parts of the Liturgy of the Hours are to be recited or the prayers said at those times. ^ A "breviary" can also mean a book of prayers to be said rather than the liturgy itself. ^ "canonical hours". American Heritage Dictionary of the English Language (Fifth ed.). Houghton Mifflin Harcourt Publishing Company. 2011. ^ "breviary". American Heritage Dictionary of the English Language (Fifth ed.). Houghton Mifflin Harcourt Publishing Company. 2011. ^ United States Conference of Catholic Bishops. "Liturgy of the Hours". Retrieved 19 January 2015. ^ a b "Divine Office". Catholic Encyclopedia. ^ McNamara, Edward. "What Should Be Prayed in the Liturgy of the Hours". Eternal Word Television Network. Retrieved 19 January 2015. ^ Pope Paul VI (4 December 1963). "Constitution on the Sacred Liturgy". The Holy See -- Documents of Vatican II. The Holy See. Retrieved 30 March 2018. ^ "Catechism of the Catholic Church, 1175". Vatican.va. Retrieved 19 January 2015. ^ "Liturgy of the Hours / Divine Office / Breviary". Ewtn.com. Retrieved 27 November 2013. ^ Miller, Charles E. (2004). Together in Prayer: Learning to Love the Liturgy of the Hours. Wipf and Stock Publishers. p. 71. ISBN 978-1-59244-626-1. ^ Woolfenden, Graham (2000). Daily Prayer in Christian Spain. SPCK. ISBN 978-0-281-05328-5. ^ Taylor Marshall, The Crucified Rabbi: Judaism and the Origins of the Catholic Christianity, Saint John Press, 2009 ISBN 978-0-578-03834-6 pages 133–5. ^ "Constitutions of the Holy Apostles". Ccel.org. 1 June 2005. Retrieved 27 November 2013. ^ Maeve Maddox, "Why 'Noon' is no longer the 'Ninth Hour'"
^ "John Cassian". Catholic Encyclopedia. ^ Felix Just, "The Liturgy of the Hours"
^ "Nova Vulgata, Psalmus 70 (69)". Vatican.va. Retrieved 27 November 2013. ^ "Chapter XXI". History.hanover.edu. Retrieved 27 November 2013. ^ a b c "In Defense of the Pauline Mass". Matt1618.freeyellow.com. Retrieved 27 November 2013. ^ a b Breviary in Catholic Encyclopedia. The article also spoke of "blemishes which disfigure this book." ^ "Laudis Canticum". Adoremus.org. Retrieved 27 November 2013. ^ I.e., the standard formula used at the conclusion of papal bulls until quite recent centuries. ^ Sacrosanctum Concilium Art 91. So that it may really be possible in practice to observe the course of the hours proposed in Art. 89, the psalms are no longer to be distributed throughout one week, but through some longer period of time. ^ "Adoremus Bulletin, April 1999". Adoremus.org. 25 October 2010. Retrieved 27 November 2013.